Yaelle Grant grew up in a suburb of Detroit and dreamed of being the next Tina Fey. When Tina Fey never responded to her fan letter asking for tips on how to be like her, Yaelle continued her pursuit of trying to be like Tina (although her plastic glasses are paying homage to Lisa Loeb, not Tina Fey — sorry). She has trained at the Upright Citizens Brigade Theater in New York and graduated from the WIT training program in 2013. One of Yaelle’s proudest achievements is that she has never accepted a piece of paper that someone has tried to hand her on the street. In her free time she likes to read young adult fantasy books and eavesdrop on other people’s conversations. Yaelle Grant was first introduced to improv comedy when she was 14 and went to see a performance by Boom Chicago while traveling with her family in Amsterdam. 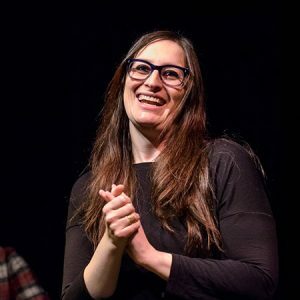 After experiencing the joy that was her first improv show, she could not get enough and once she moved to New York she knew that she had to get involved with the improv community. Yaelle took classes at the Upright Citizen Brigade Theater in New York while seeing as many shows as she possibly could. Upon moving to Washington D.C. she was so excited to take classes at the Washington Improv Theater and joined her first indie team called Temporary Surcharge. At first improv was a way to make new friends, laugh, and take a break from real life. Then improv became so much more! She would like to help you enjoy this amazing world and learn skills that help you be present in the moment and enjoy this beautiful improv world.